The idea is to drench signal into areas where crowds of 5G device users are likely to congregate - places such as stadiums and train stations. Fujitsu claims it’s come up with the world’s first technology to enable simultaneous communications to just four users with a single antenna panel in the 28-GHz band. It says this the world's most compact structure, but that doesn’t stop the equipment delivering high-speed communications of 10 Gbps, as required by 5G. Conventional 5G system structure require use of an antenna panel for each terminal when simultaneously transmitting to multiple terminals. Now, by controlling with high accuracy the phase (angle) of signals separately emitted from 128 antenna elements, Fujitsu Laboratories has suppressed the interference between signals. This enables simultaneous communications in four directions using only one antenna panel. Moreover, the company can vary signals in both horizontal and vertical directions, successfully expanding the communications area. Fujitsu Laboratories Ltd. today announced the development of the world's first equipment technology to enable simultaneous communications to four users with a single antenna panel in the 28-GHz band, in the world's most compact structure. The equipment delivers high-speed communications in excess of 10 Gbps, as required by 5G mobile communication formats. The use of 5G is premised on deployment of base stations with comparatively small coverage areas placed every few tens of meters. Given this, it will be necessary to have equipment of a compact size that can be deployed anywhere. Conventional 5G system structures require use of an antenna panel for each terminal when simultaneously transmitting to multiple terminals. Now, by controlling with high accuracy the phase (angle) of signals separately emitted from 128 antenna elements, Fujitsu Laboratories has suppressed the interference between signals. This enables simultaneous communications in four directions using only one antenna panel. Moreover, the company can vary signals in both horizontal and vertical directions, successfully expanding the communications area. 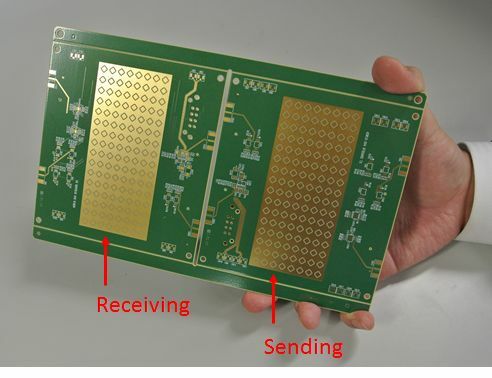 With these developments, components can now be fit on a single 13 cm2 printed circuit board, instead of two or more antenna panels required with conventional technology. This will enable the deployment of compact base stations and high-speed 5G communications in locations where many people gather, such as around train stations and in stadiums. The spread of smartphones, 4K image resolution, and VR has raised demand for high-speed wireless communication. Meanwhile, problems like transmission delays and poor connections due to insufficient wireless communications capacity are occurring in urban centers, stadiums, and event venues, and anywhere many people gather. To remedy these shortcomings, the development of 5G, which uses the millimeter wave band to secure a wide frequency band, is being carried out globally, with the goal of commercial deployment around 2020. While 5G can provide high-speed, high-capacity communications in excess of 10 Gbps, its radio waves are very one-directional and blocked by obstacles. As such, the use of a method called small cells, in which base stations are deployed every few tens of meters, is anticipated. Commercialization also requires compact equipment that can be easily installed in any location. 5G base stations make use of a technology called beam-forming, which controls the phase of signals emitted from the multiple antenna elements on the antenna panel and concentrates the radio waves in the desired direction. This divides and multiplexes beams, to handle simultaneous communications with multiple users. Currently, to avoid radio wave interference during communications with multiple users at once, base stations have been configured to use a number of antenna panels corresponding to the number of concurrent users. To miniaturize the equipment so that it can be deployed anywhere, the best option is to provide multi-directional transmissions from a single antenna panel. 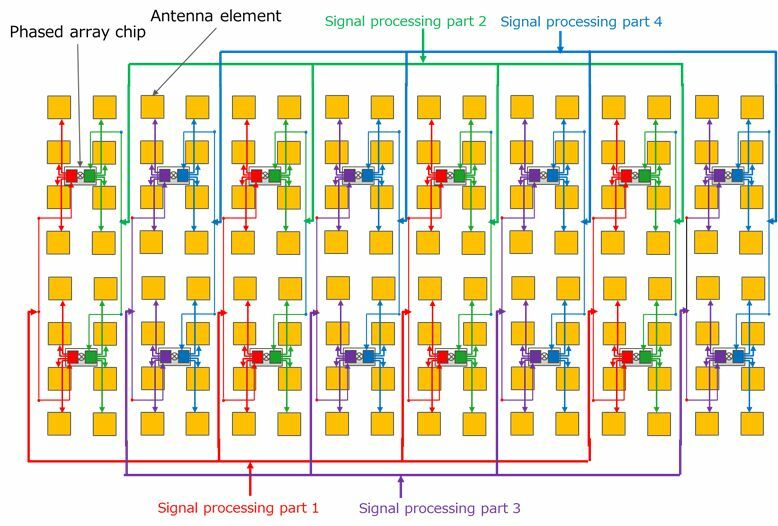 Fujitsu Laboratories developed a phased array chip using a technology (patent registered) that can regulate the phase of a signal propagated from an antenna element with accuracy of one degree or less, and built into the panel one phased array chip per eight antenna elements. The company also uses circuitry that detects the differences in phase between phased array chips, which enables highly accurate phase control for any size antenna panel that has between 64 and 256 antenna elements. As a result, by holding the difference in undesired emissions intruding between one radio wave communicating with a device and another radio wave with another device to 20dB or more, it makes it possible for a single antenna panel to carry out high-capacity communications of 10 Gbps or more. Detecting the phase differences from the signals produced by each antenna element and controlling the phase with high accuracy to concentrate the signal in the desired direction, these technologies successfully led to compact equipment that transmits to four users simultaneously with just one antenna panel. The compact equipment propagates radio waves on two axes, including horizontal and vertical directions, enabling wide-area communications with users. These technologies led to the prototyping of a 13 cm2 antenna panel equipped with 128 antenna elements and 16 phased array chips. Accordingly, Fujitsu Laboratories confirmed that a single antenna panel can deliver high-speed transmissions of 2.5 Gbps per person, for a total of 10 Gbps, and carry out beam multiplexing in four directions. By using this antenna panel, it will be possible to build small, energy efficient 5G base stations. Fujitsu Laboratories will continue to raise the performance and reliability of this technology, and aim for commercialization around 2021.